It is important with a plier on a multitool that it got a good design because the design and quality goes hand in hand. The cut parts and anatomy of the plier is important when using it. 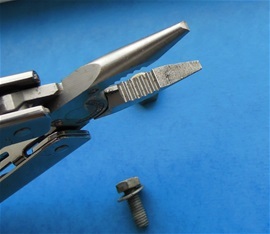 A bolt or a screw got edges that can be used in the pipe grip that is located in the middle section of the plier on the picture. I believe pipe grip is the English word for it. Use a strong grip to avoid slipping because this will make the bolt or nut turn inside the pipe grip. If a bolt sit very hard and the only way to open it is with the pipe grip then a strong steady grip is needed. 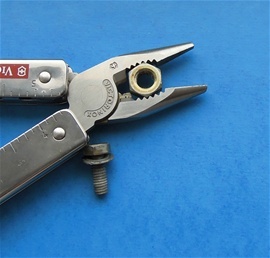 Make sure the edges of the nut or bolt sit well inside the plier. No matter how strong a grip a person got a slip will happen. 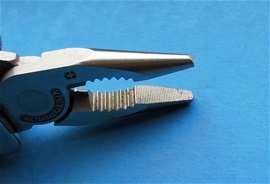 The SwissTool is solid and this you can see inside the plier that the cut parts are designed for this. On the picture above are the areas i usually give some oil. If it is used around or in a salt water environment then some maintenance is needed. The SwissTool is strong against corrosion and it will last a long time. If you look at the picture above to the left i use some oil on both sides of the plier, then I move the plier up and down a few times until oil comes out of the center rivet that holds the plier together. Then on the top to the right i put some oil on both sides as well. Next is on the bottom to the right and here I use some oil on all four sides at the rivets. 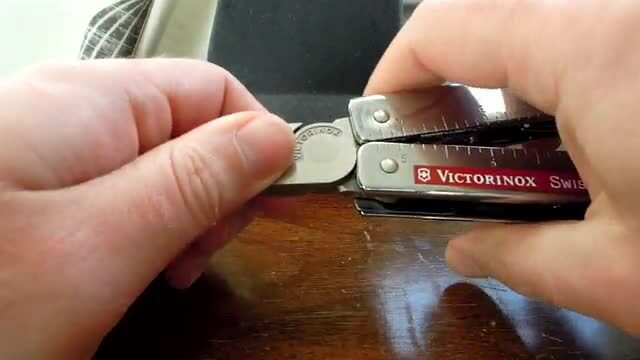 After this I open and close the plier completely a few times. The SwissTool plier is actually very good to remove the hook from a fish with. I use the front section of the plier. 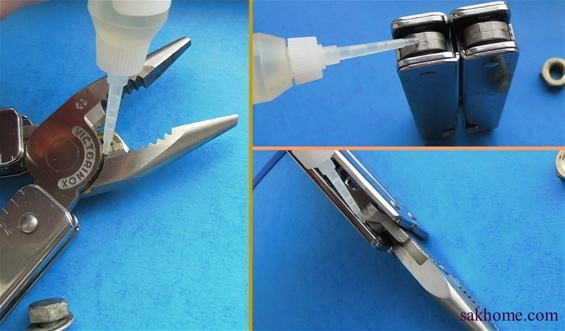 If rust or corrosion happen inside the plier sections then use some rust remover to clean it. It is also possible to use a metal brush to remove corrosion. The SwissTool is one of the strongest against corrosion. Cleaning and maintenance is best to do when you come home and not later on. If this is done from time to time then no corrosion will happen. 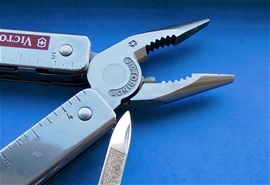 The Victorinox SwissTool got one of the largest pliers on multi-tools in the world. The tip is a bit wider and this can be an advantage sometimes. For removing a hook from the fish a plier can be a valuable or helpful tool indeed. There are many special purpose pliers for such tasks on the market. 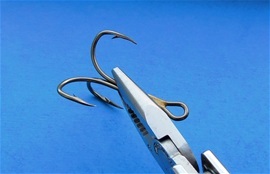 I have used the SwissTool plier for removing hooks from larger and smaller fish with good result. I did learn that it is actually helpful with a wider tip when you have to use some strength to remove the hook. It is a much more secure feel when a treble or a single hook has gone through bone. Then you will need to use some strength to remove it. If the tip is to narrow then this is more difficult. There are different technics for removing a hook as well. On the pictures you can see a large combination plier compared to one of the SwissTool plier variants. I like a wide tip on a plier because this is the best “all use” style for many different tasks. Or the combination of two pliers can be useful. 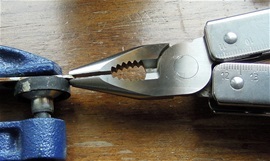 Maintenance is important on most pliers after use in saltwater. This will increase the lifetime. On this page and on the text in this article are factors already mentioned on my feel on the pliers. It depends on experience and environments. In general you do not need much strength to remove a hook from a fish. A good grip and a small twist/push and guide are all that is needed in general. The wide tip on the SwissTools is helpful because you have some surface to use. When a hook has gone through bone then you need to use some force and push. The extra surface on the tip area is very helpful then. Some prefer the needle nose on small fish. If you are experienced then you can do a lot with any plier. The problem is when you must use the plier for mechanical task and needs that require harder use. On nuts and bolts you may need both strength and strong pliers! The extra width on the tip is also helpful when you must use that area on a screw, nut or bolt or when you must bend materials that require force. It is as always a matter of feel and what people prefer. The use they need it for and so on. There are advantages and disadvantages in different philosophies and designs. For light bending tasks the needle nose are very good, for tougher use it is not. For mechanical tasks you may need two pliers! The key with a multi-tool plier is to find the average or type that can be used on almost anything. The hybrid may be the best so far. Check out my video below on my philosophy on needle nose and the hybrid Victorinox SwissTools plier in an “over all use” sense. I like both needle nose pliers and the SwissTools pliers. There is an advantage with a hefty design. 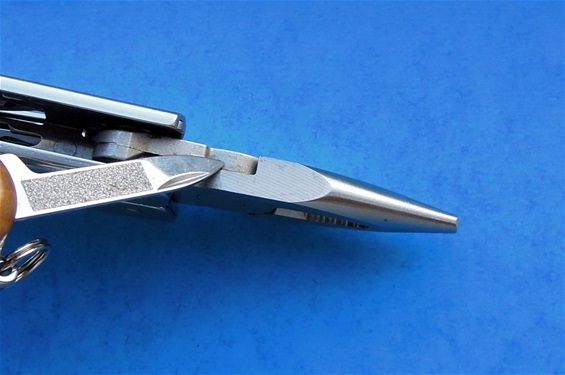 The Swisstool pliers are one of the best in the world because it is a kind of hybrid. Such designs and hybrid types can be found on a few other tools in the world. The SwissTool is the most successful. The needle nose does have a weakness that is important to remember. There are a few other modifications done on the SwissTool pliers in history as well with the design and forces working on a plier in motion. It is not uncommon that there is some play in the SwissTool pliers and this you do not need to worry about at all. For twisting and bending of materials you can use different technics that may make the strain on a needle nose plier less. But for sure in some situations you must have a stronger plier design no matter what. It is sometimes comfortable to grip and use force when turning a device. If you learn a tactical philosophy then the combination of two tools may be the best. I any situation a backup is smart. The SwissTool pliers are the most successful plier in the history of multi-tools so far. The plier jaws are riveted and the forces working on the plier will dispense. The forces on a needle nose plier vs the rivet and construction will flex. On a needle nose it is very easy to disrupt the balance at the nose /tip section. This mean as I see it that the tip must flex in more than one direction at the same time during grip and twist motion, not well. That balance is very difficult to make. With the hybrid you will get stability at the nose/ section. 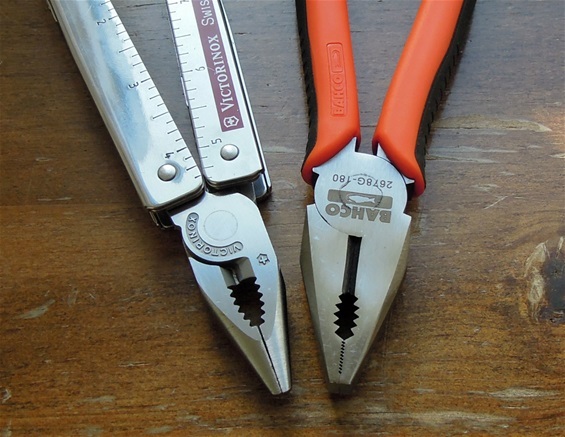 Average use and abuse are two different things and the size of the pliers is a guide for what uses it is intended for. Proper use is important to know. I have tested a few knives the last years. I am basically a collector and normal user. I have tested a few things as well for knowledge. There are more forces working on a plier during use depending on dimensions and the force applied during use. 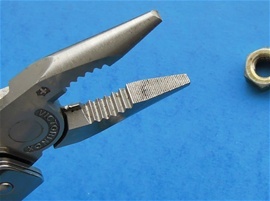 There must be a balance between the rivet and the thickness of the plier jaw, see picture. Breakage at this area should never happen. Then I believe it is not in balance or the tempering is not correct. The SwissTool does not break or it would take a gripper to do so. Solid thickness and material that is enough for the complete balance even so Victorinox improved it. When removing a treble hook or any large single hook it is an advantage with a wider tip because the extra surface will help for the grip. With a slim needle nose design it is more difficult to grip and it is easier to slip. This is so on mechanical work as well or any tasks that require the little extra. Second video on my SwissTool hybrid plier and my philosophy. I have much more fun yet. 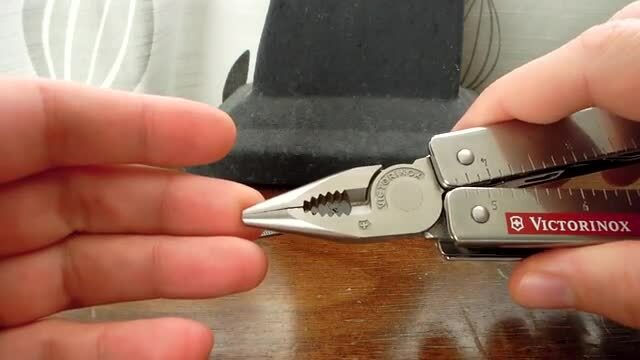 It is important to remember that on a multitool that the plier itself is a multitool. It can cut, turn, grab, bend or be used as the extension of the human hand. If you notice on the hybrid plier used on the Swisstools you will discover that the rounded part on them can be used for different tasks. This part also makes it possible to turn the plier and avoid any damage on the components around. It makes it possible to reach tight places to some extent. It is here that the needle nose design is at its best. The hybrid will fit very well too. The rounded part of the plier jaw can be used to bend steel wire and depending on the place on the jaw, at the tip or closer in you can make dimensions on the part you bend. If you make a loop it can be in different dimensions. You can do it! In my second video i explained that the needle nose design can get in trouble when bending. It is the same thing for pulling. The flexibility may influence but the problem as I see it is the less surface to work with. If a device is stuck and you only have a few millimeters to grab on to then you may experience the same trouble. You squeeze harder and it slips again and so on. The hybrid design is better because it is more stabile and you have some surface that is bigger. This tactical factor is important to know. Do not get me wrong! The needle nose is an excellent tool but it got some different limits. A power grip is the one that you have stability and power with. You can squeeze with further force. Take advantage of the handle and you may adjust your hand or grip further back to increase the force applied. With gloves it can be different for the feel so have this in mind with any multi-tool. Remember when you use force if necessary that you have a stabile grip. It may happen that the tool will twist in the hand and you will experience a slip. The picture is just to show and it is not the proper way to test. 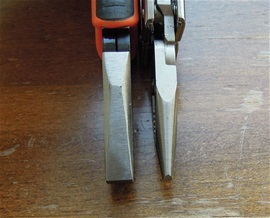 If just a few millimeters with some width are sticking out then you can use the plier and pull the device out if stuck. This can be on weapons, engines or any gear. A needle nose may get trouble here if it is stuck hard. If the part that is sticking out is narrow as well then one would expect the needle nose and hybrid to perform the same? No! The hybrid is better even so because of the factors mentioned in my page. The cut sections on a plier on the tip/nose are important for the ability to grab a material and pull or turn. On any quality plier in the world this is usually not any problem. The cut teeth for the nuts and bolts must be correct for the best functionality. Remember that a sturdy design and a firm grip are important to avoid slipping when force is applied. The plier on the SwissTools is certainly not soft and they can take mechanical work very well. The cut parts will get some worn in time that can influence the performance and this is so on any tool. Please take the time to read my pages on the SwissTools for the complete picture, good luck! Sideways pulling with a plier is usually never comfortable or the best for strength. If a device is stuck then you can damage the tip on the metal you are pulling, hence making a notch for the plier to grab on to but this is not fun…rock on!